The following is taken from Trench Fortifications, 1914-1918: A Reference Manual, French Trench Warfare, 1917-1918: A Reference Manual, and the 1916 and 1918 editions of the Manuel du Chef de Section d'Infanterie ("The Manual of the Infantry Section Leader"). 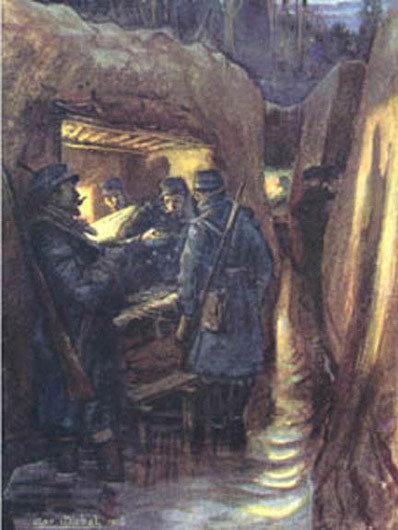 The subject of French army shelters and dugouts (along with trench construction in general) can not be studied without viewing it in the context of the mindset of the État-Major ("High-Command"), which rested entirely on the notion of offense, both on the strategic and tactical levels. Many generals, particularly the most senior commanders, refused to accept the fundamental reality of the war that came about with the first trench systems in the fall and winter of 1914. To them, trench warfare was simply a transitional stage of the war which would eventually be broken with the transition made back to open warfare again. This view was reinforced with the fact that France had been invaded and French sacred soil under German occupation. On the tactical level, French army doctrine of the time emphasized the offensive solely. The État-Major feared that if their men were permitted to dig deep, formidable entrenchments, a bunker-mentality would develop. The men would lose their offensive-spirit and become content to stay where they were. This was something that had to be absolutely avoided. 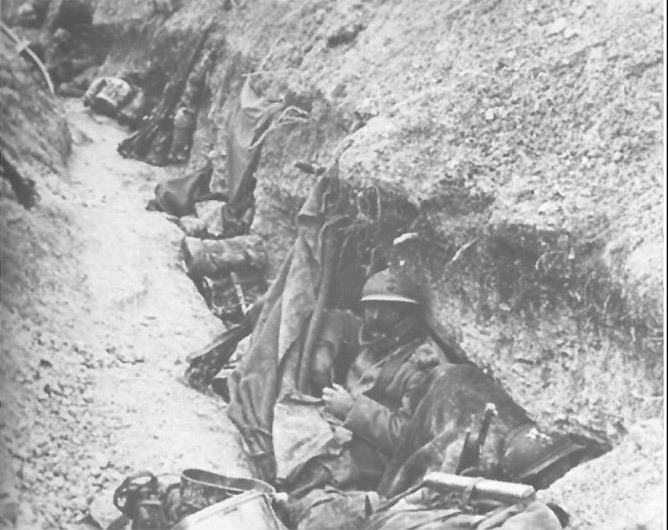 As a result, French soldiers were prohibited from constructing large, deep dugouts and well-entrenched positions as the Germans did. Rather, they were to remain constantly ready for the attack. Following this line of thought, the État-Major saw no reason to invest a significant amount of time and resources in the training of entrenchment techniques or construction supplies before the war. Only the génies ("engineers") were given this specialized instruction and there were far too few of these units. Instead the men taught themselves by learning from their own experiences in the field. This helps to explain the governing force over all trench construction and indeed the French army as a whole: System D (the 'D' coming from the verb débrouiller, "to muddle through"). Under this system, problems which could not sort themselves out were resolved through improvisation. This was reflected manifestly in the patchwork appearance of French entrenchments, and the generally less-reinforced shelters and dugouts. French abris ("shelters") went by many names -- niche, cagna, gourbi, guitoune, hutte -- all of which carry a somewhat negative conotation. Variably, they translate as niche, shack, hovel or hut. When clusters of shelters formed, the soliders would often bestow it with a name, such as Village Nègre ("Black Village"), Village Blanc ("White Village"), Village Indien ("Indian Village"), Marmite-Cité ("Stewpot City" -- i.e. "Shell City"), or Zoulouland ("Zululand"). They also named the shelters themselves. 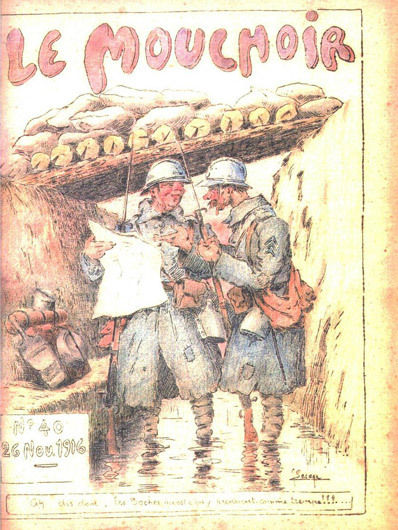 For instance: Mon Abri ("My Shelter"), Villa Belevue, Villa des Totos ("Lice Villa"), Villa des Branquignols ("Stretcher-Bearer Villa"), Cagibi ("Storage Room"), Rendez-vous des Marmites ("Rendezvous of Shells"), Puce qui Renifle ("Sniffling Flea"), Rat-Porc ("Rat-Pork"), Demi-Vierge ("Half-Pure"), Trouville-sous-Bombarde ("Holeville-under-Bombard"), Au Crapaud qui Croasse ("Croaking Toad"), Au Rat Qui n'est pas Mort ("The Undead Rat"), Le Rire aux Éclats ("The Bursting Laughter"), Hôtel des Courants ("Hotel Drafty"). By and large, French shelters were much more rudimentary than those of the British and (more particularly) German armies. 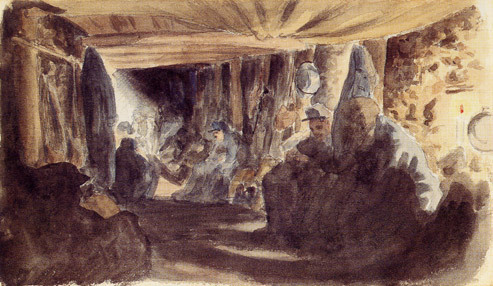 The primary materials used in shelter construction in the French army were logs or wood poles, rocks and dirt. To a lesser degree, planks, sandbags, corrugated sheets of metal, steel rails and iron sheets were used. Unlike the German army, large, saw-cut (angled) beams were not employed nearly as commonly. The strength and depth of a shelter was determined primarily from the importance of the men who would be occupying it and the purpose of the position. Postes de commandement (P.C. ), or "Command Posts," constituted the best constructed shelters. They were generally located in the cover trenches of the first line, or in the second and support line trenches. The Regiment and Battalion P.C.s (for colonels and majors) were generally dug to a depth of 3 to 6 meters (9-20 feet) and were reinforced with varying layers of logs, rails, rocks and dirt. The floors and ceilings were either made of planks or logs, with the wall often planked as well. The Company P.C. (for captains and lieutenants) was usually less deep and less reinforced. Lighting was primarily done with karosene lanterns and candles, though electric lighting did exist in a small minority of cases. Heating was normally provided by a small stove or two. Furnishings usually consisted of a few cots or beds (made of planks, sticks or wickerwork, padded with straw), some chairs and a table. Three examples of Command Posts. Other positions that were given priority and were thus better entrenched and fortified were machine-gun bunkers, telephone, signaling and observation posts, weapons and supply depots, and, whenever possible, first-aid stations. Logs, planks, and steel or iron sheeting were often employed in the construction of these. Furnishings were generally more rudimentary, with crates normally used as chairs and tables. If there was a heating source it usually came from a small brazier filled with coals. Last on the pecking order were the foot-soldiers. The conditions of their shelters varied, but in general they proved woefully inadequate for most of the war. Improvements only started coming about in the fall of 1917 to meet the demands of rebellious, discontent soldiers. Materials used in the construction of the foot-soldiers' shelter normally included sticks, wattles, gabions, and sheets of corrugated metal. To a lesser degree, sandbags, small logs, and planks might be employed. Universally, these shelters were dark, dank, filthy, vermin-infested holes or shacks that brought misery to every soldier. The only source of light came from candles. However, if the shelter in close proximity to the enemy and more exposed (as these shelters would have often been), lighting was prohibited. There were few furnishings, if any: maybe some crates for chairs and a table. Bedding usually consisted of some straw thrown sparingly on the floor. If the soldiers were lucky to have a source for heat, a small brazier might be used (again, this was subject to light restrictions too). Whether the positions were in the first, second, or third line. Three examples of shelter locations in the trenches. Note the proximity of the shelters to the observation (a.k.a. sentry) posts. The two most influential of these factors were the first and last ones given: whether a given sector was active or quiet, and whether the positions were of the first, second or support lines. If the sector was "dead," substantial shelters and dugouts were often constructed both underground and at ground level. If a sector was active, generally shelters were lesser in quality and quantity, though still existent. The P.C.s and machine-gun posts were still well-entrenched (though even they were susceptible to direct hits from heavy shells), however most other positions were not as adequate. Furthermore, if a large offensive was on-going, the chances of having a strong dugout or shelter was even further reduced. Enemy artillery fire was the main culprit, as shelters were constantly destroyed and it was difficult to make progress on new fortifications. Also, the lines were constantly shifting, even if only by tens or hundreds of meters. This too resulted in fewer shelters being constructed. Inclement conditions such as heavy rains and mud, often lead to the shelters collapsing. Battles like Verdun and the Somme became legendary for the complete lack of shelters for troops, who were exposed to gunfire and the elements, alike. By and large, trench shelters in the first line were negligible to non-existent. Mostly, this owed to the proximity of the enemy and the resulting fire that was inflicted upon these positions. This was true even in the quieter sectors. Where trench shelters did exist, they were composed of a small recess or niche scraped into the trench wall under the parapet (on the side facing the enemy) and were large enough for only one or two men. In loose or rocky soil, the shelters were sometimes lined with boards or sticks. 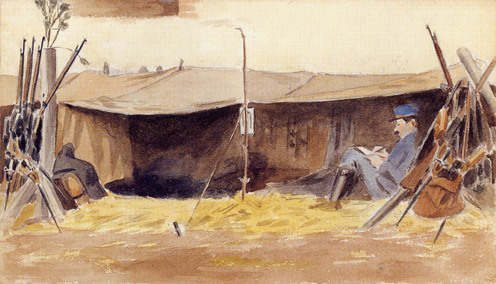 The soldier's tent canvas normally provided the only source of enclosure. If the soldier was lucky, he might find some handfuls of straw to spread on the floor but usually there was only the mud. Alternately, a section of covered trench could be used as shelter, consisting of a simple roof of light logs or poles laid across the top of the trench, covered over with a layer of sandbags or earth up to a foot thick. However, abundant examples exist of less reinforced covered trenches that consisted only of a layer of light logs or a panel of corrugated metal straddling the trench. Again, a tent canvas or blanket was hung from the logs to seal the shelter off. Three examples of light shelters, the first and third of which are meant only for one occupant. The middle example was for two men and had a removable board that was placed over the gap created in the firing step when excavating the shelter. Its dimensions were: 3'3" long x 2'7" wide x 4'3" high. Two examples of light shelters, the first one utilizing stakes placed every few feet with planks or corrugated metal laid on top. The second shelter makes use of a gabion. Two more examples of light shelters. The first one consisted of a plank for a roof which acted like shutter in that it could be thrown back in order for the men to fire over the parapet. The second shelter consisted of two earth benches (where two ranks of men could sit facing each other) and a roof made of a layer of logs or poles resting on a crossbeam log, which was laid on top of the parapet. This was covered with a layer of earth up to 1 foot thick. The shelter was 3 meters in length. Examples of light shelters and covered trenches. 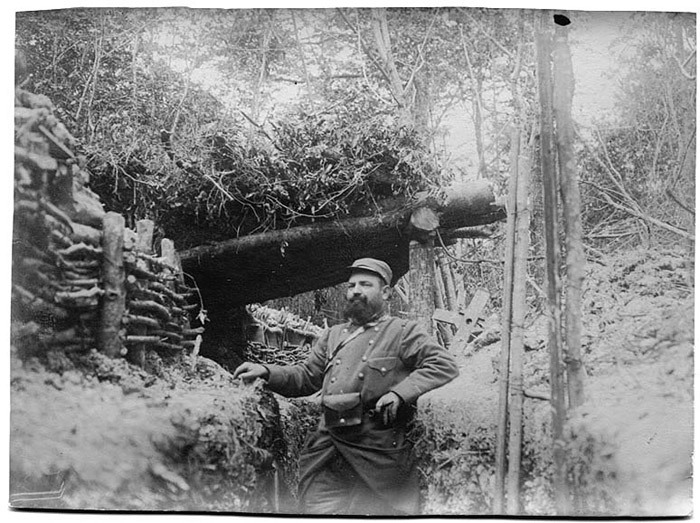 By late 1916 the French army began experimenting more with the tactic of "defense-in-depth," wherein the first line was intended as merely a delaying position to be only lightly manned. Therefore, even less thought was given to constructing any real form of shelter. In case of enemy bomardment or attack, the men in the first line would fall back to the first line cover trench or to the second line, where the main force of troops were located. Following this logic, dugouts were to be built primarily in the second line trench in order to protect the reserve troops in these positions. These were normally only large enough to fit a squad (on average, 6-8 men), though larger versions were also made to fit a half-section (2 squads, or 12-26 men on average). Logs and dirt were the primary materials used in the construction of these. Planking was used sparingly and parsimoniously. Their might be a bench or some crates used for seating. Bunks were not allotted for, the men sleeping on the floor or seated, almost always packed together like sardines. Lighting came from candles and small lanterns. Sometimes a brazier could be found for heating. In the third line or support lines, there were also dugouts built which provided shelter for troops that were to act as a counter-attack force in case of enemy attack. These were similar in construction to those in the second line. The interiors were identical as well, though they were sometimes better provisioned in the way of furnishing and heating. Three examples of second or support line shelters. The first example shows a shelter 4 meters in length (providing shelter enough for 12 men). It could also be dug outside of the trench system, attached to the trenches by means of a zigzag communication trench. The second example was a shelter intended basically for a squad of 6-7 men. The planked roof could be substituted by one of logs or flat sheets of iron. The third example could hold 12-14 men. Examples of the normally cramped interior of shelters. 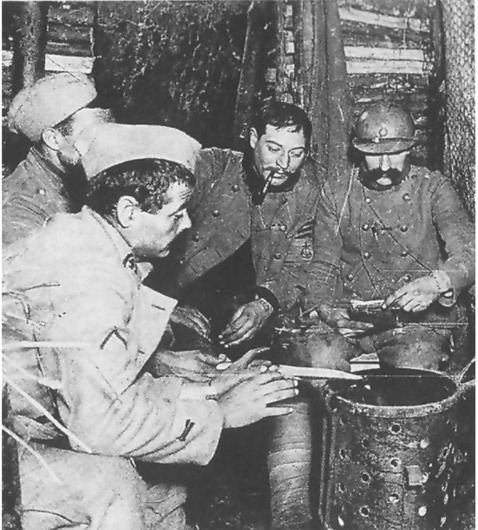 In the photo, the men warm themselves by a brazier. One other type of shelter found in the support lines and outside of the trenches was a partially above-ground version of the dugout, which was meant to withstand a direct-hit from a medium caliber shell and a near-hit from a heavy shell. They utilized heavy arched frames (made of sheet iron or formed from logs) or square frames as reinforcement. Two examples of strong shelters in the support lines composed of corrugated iron and log arches, respectively. Each was approximately 3 meters wide (at the base). These were dug outside of the trenches, in the open. The third example shows a shelter excavated into an embankement. Two examples of shelters in the support lines utilizing log frames. The example on the left shows a shelter excavated into an embankement. The shelter on the right was large enough for 6 men. The log roof could also be substituted by flat sheets of iron. Shelters for soldiers in the rear were often just as inadequate and miserable as those up at the front. When the men were not billeted in barns, stables, shacks, or the ruins of buildings, they lived in earthen huts or wooden barracks. The smaller, more primative huttes ("huts"), or guitounes ("shacks") as they were also called, were constructed of sticks, wattling, straw, sod and canvasing. They took three basic styles: A-frame (gabled roof), squared-frame and lean-to. In the case of the A-frame style hut, the framework was formed by poles driven into the soil, which were fastened together near the top. The walls were made of wattling or wickerwork on which was stretched a covering of 2" of mud and straw. Above this was a lightly trampled bed of earth, preferably clayish or clayish sand in consistency. The squared-frame and lean-to huts were generally not as elaborate. The walls of both were made of wattling and sticks covered over with a layer of straw, grass, sod and mud mixed together. The roof was made in the same manner or else by means of canvasing. In the case of lean-to style, the outer wall opposite the embankment had two vertical supports (poles or logs) on either end which had forked-ends. A crossbeam pole rested between these, which supported the roof of poles or light logs, covered over with hay, straw and/or sod. Once again though, canvasing could also be used for the roof if materials were lacking. The huts varied in size, from those meant for 4-5 men, to those that could house a full squad (7-12 men). The more sizable, less primative casernes ("barracks") were constructed mainly of planks, with corrugated metal and tar paper used on the roof. Generally, they were 16' wide with two rows of bunks on either side and a central passage between them. In the winter, a stove was provided for and placed near the center of the barracks. To offer better protection from the cold, the barracks could be partly placed in an excavation (for instance, into the side of an embankment), surrounded by a bank of earth up to the roof. Furthermore, the walls could be doubled and the space between stuffed with hay, straw or sod. The barracks were generally large enough to hold two or three squads, or 14-32 men). In the case of both huts and barracks, lighting was provided by candles and lanterns. The huts and barracks were sparsely furnished with wooden benches or chairs and a table, though once again, ammo and supply crates were often employed for the same purpose. Bunks consisted of either wooden planks or sections of wattling or wickerwork. They were about six and half feet long and each man was allotted 28" of space. If straw was available it was used as bedding, either spread out loosely or stuffed inside canvas tickings. Examples of rear-area huts. The first example is intended for a squad and the second for a half-section (both about 25' in length). The third is a hut for officers. Examples of rear-area shelters built into the side of a road embankment. Often times, no shelters would be available for troops stationed in the rear. 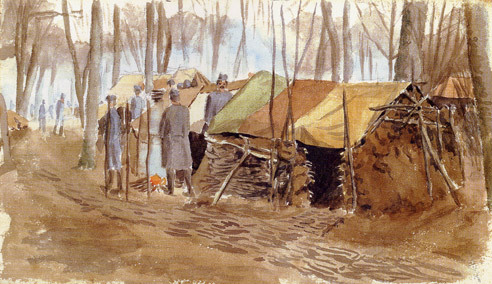 In those cases, or when the time and/or material was unavailable to construct anything, the soldiers paired together to make their 2-man pup tents using their individual tent canvases. Vast camps up tents covering dozens of acres would sprout up overnight in the fields and pastures alongside roads. This was particularly common in those sectors or regions that were seeing a large, on-going offensive. While regs existed detailing how these were to be laid out, just as often they were thrown up pell-mell in no order whatsoever. When available, some handfuls of straw might be procurred for bedding. In the summer, these camps were choked with dust; in winter, they quickly turned into vast swamps of mud. Either way, the tent camps were filthy places to live. Examples of the layout of tents (top) and a NCO's tent shelter erected against a building. 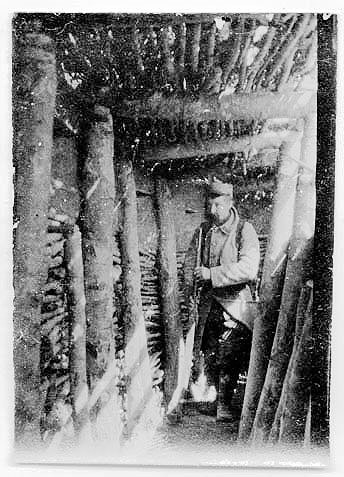 Another type of shelter soldiers made use of in the rear were bivouacs, which they constructed themselves using sticks or a section of wattling. The product was a simple lean-to style shelter which would not be well-suited for adverse conditions. Examples also exist of men digging square-shaped holes in the ground, 3-4 deep and about 6 feet in length, which were big enough to fit 3-5 men snugly. Tent canvases or branches would then be stretched over the top as a roof. Examples of bivouacs made in the lean-to style with sections of wattling. On top is an individual shelter and below it, a group version with a fire-pit at the center.